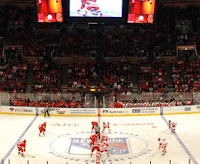 Red Hot Hockey at Madison Square Garden proved to be a milestone moment for college hockey and, in particular, for BU. Energized by the spectacle and an electrically-charged sellout crowd of 18,200, the Terriers, in their white home sweaters, came out white-hot and lit up Cornell for three first-period goals en route to a 6-3 win. Recaps from USCHO, The Boston Globe, The New York Journal News, CSTV RinkRat Elliott Olshansky and the goterriers.com site are available and we’ll add more links as articles are posted. Olshansky points out that the sellout crowd, clearly a pleasant surprise to both coaches and to MSG, already has people talking about a rematch not too far in the future. Jack Parker is fueling the fire. "It's possible that we could bring this game back here two years from now," he said, "I'm sure that Madison Square Garden would like another packed house." ● Four of BU’s six goals were scored by Terriers connected to the Tri-State area: Colin Wilson, who was born in Greenwich, Conn., when his dad, Cary, played for the Rangers; Pete MacArthur, from Clifton Park, N.Y., a lifelong Rangers’ fan, West Haven’s Joe Pereira and Skillman, N.J.’s Luke Popko. Pereira, who moved into the lineup when Jason Lawrence was injured, added an assist and drew a penalty with his speed in just his fourth start of the season. Matt Gilroy, whose pass sprung Brandon Yip for BU’s third goal, found himself skating in the same arena where his father, Frank, played basketball for St. John’s a number of times in the early 1980s. ● MacArthur's goal was the 50th of his Terrier career. The previous player to reach that milestone was David VanderGulik in 2005-06. ● The crowd included a contingent from the Youth Hockey League of New Rochelle, Kevin Shattenkirk’s home, and dozens of fans in red BU T-shirts with Gilroy’s name on the back. Gilroy is from North Bellmore on nearby Long Island. ● Like the game, the pre-game pep rally, was a rousing success, with some 400 BU fans packed into the Garden’s Club Bar & Grill. The gathering featured a dinner buffet, a silent auction of hockey collectables (why was a Tony Hawk skateboard on the table? ), a jazz ensemble of BU students and appearances by 1980 Olympians Mike Eruzione, Jack O’Callahan and Dave Silk. The already-excited crowd, further jacked up by the BU Band and the bell cheer, heard from Coach Parker, former Coach Jack Kelley, Athletic Director Mike Lynch, President Brown, Dean Elmore and emcee Bernie Corbett. "My guys wanted to go out on the court; the Knicks' court was down. I said, 'Hey guys, knock it off with that,' and someone said, 'Hey, let those guys do what they want. They're the only guys who can sell this building out.' "
● Other ex-Terriers seen at the game included: Brian Durocher, Michel Larocque, Dan Ronan, Jack Baker, Pat Aufiero, Brian Collins, Mike Sylvia, Chris Mays, Dennis O’Connell, Tom Ryan and John Sabo. ● The ceremonial puck drop included Jack Kelley and famed Cornell coach Ned Harkness. The latter was accompanied by John Hughes, captain of Cornell’s 1970 national champions and father of Olympic gold medal figure skater Sarah Hughes and top U.S. skater Emily Hughes. Note: Look for a Q&A interview with Coach Kelley coming soon to the blog. ● The Garden’s message board cited several BU birthdays, including Boomer Ewing on Friday and Victor Saponari two weeks ago. ● Sunday morning before returning to Boston, the Terriers paid a visit to the Ellis Island National Monument. CSTV had reported they'd visit the Statue of Liberty, but plans were changed apparently at the suggestion of broadcaster Bernie Corbett. It was wonderful seeing Red & White everywhere. Great atmosphere; great fun. I'd love to see this game return to MSG every 4 years, maybe -- keep it special, always on the Saturday after Thanksgiving. Of course, I would have enjoyed a different outcome, but the better team clearly won on Saturday. Interestingly enough the so called "bell cheer" began at Cornell. It was brought to BU by Dan Shapiro and Lee Weinstein where it has become ingrained. Over the years, I enjoyed the masked students who would pop out in different sections and at the Garden as well to launch the bell cheer. "I'm a coach, not a marketing director," quipped Cornell coach Mike Schafer. "But obviously, we'd love to be down here every year. I'm sure that [BU] Coach [Jack] Parker and ourselves, and people at Cornell and BU, will talk it out and try and get back here as soon as we can." "We can't do it next year because we're both booked up with our schedules," said Parker. "But we'd like to come back here again. The next time we're supposed to play Cornell is this weekend, Thanksgiving Saturday, two years from now at our place [at Agganis Arena]. And then the third year it's supposed to go back to Lynah [in Ithaca]. "So it's possible that we can bring this game back here two years from now."